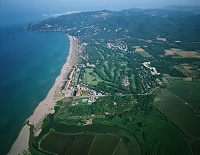 Costa Brava in the north east of Spain is home to excellent golf at Playa de Pals and Emporda, as well as PGA Catalunya, home of the European Tour 2009 Spanish Open. The countryside is lush and rustic and largely unspoiled by commercial or holiday development. The Costa Brava area was once a haven for artists who flocked to Salvador Dali’s house in Cadaques. The town of Pals, near La Costa Resort is a beautiful restored medieval village with 4km of beach at the coast. Capital Girona is a walled town of Roman origin. Examples of Roman ruins and Romanesque architecture abound. The Golf Resort of La Costa is on the coast, and is a short drive from Platja d´Aro which offers 3km of busy beach, bars and shops and a thriving nightlife.